Antoni Gaudi was born on 25th June 1852 at Reus in the province of Tarragona and was one of the most controversial art nouveau designers of all time. 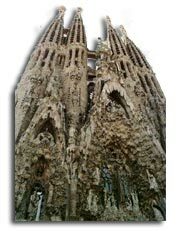 Catalan architect Gaudi, was a devout Catholic whose faith was an integral part of his creative vision. He trained in Barcelona and became the most famous architect of the Modernista movement, drawing on gothic and Moorish traditions to create a unique plastic-organic style. Through his involvement in conservative Catholic politics he gained commissions from the industrialist Eusebio Guell and the Catholic Church. In 1883 he was appointed Director of Works for the Sagrada Familia cathedral in Barcelona, which was started by the architect Francisco de Paula Villary Lozano. Gaudi set about redesigning the building and he continued working on it until his death. Antoni Gaudi’s life’s work is closely associated with the city of Barcelona. The city owes many architectural jewels to this imaginative and very individualistic master builder. The keynotes of his architecture were fluid lines and extravagant exterior decoration much of it done by using a mixture of applied materials to the outside walls. His best known building is the cathedral, Temple de la Sagrada Familia, which is still incomplete, and where the outside seems to have seeped and flowed in some places, while in others it is moulded into organic shapes. The architectural designs detailed above and many others stand testament to Anton Gaudi and his reputation as an outstanding Art Nouveau artist.